It's not Uber until it's over. (SPOT.ph) Ever since the Land Transportation Franchising and Regulatory Board started its witch hunt against Transport Network companies in the Metro, commuters have been dreading the day that the government agency would suspend Grab and Uber. And that day has come, on a weekday at that. 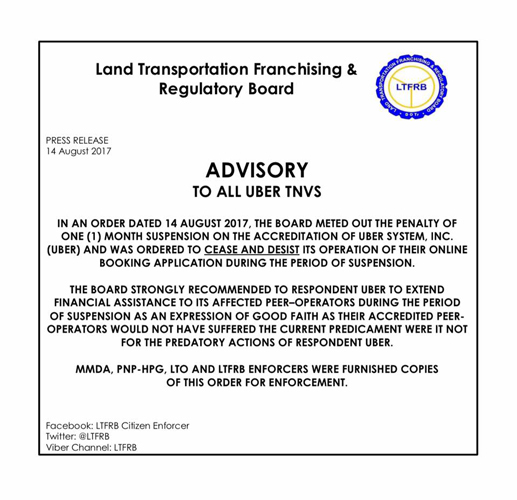 In an announcement on August 14, the Land Transportation Franchising and Regulatory Board (LTFRB) "ordered to cease and desist [Uber’s] operation of their online booking application during the period of suspension" for one month. This comes after the ride-sharing service supposedly violated LTFRB's order to stop accepting applications for accreditation. LTFRB Spokesperson Aileen Lizada said in an interview with CNN Philippines that the company activated at least three vehicles a day after the ruling has been issued. 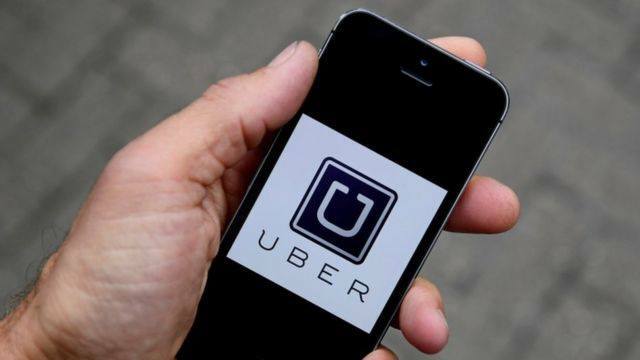 The agency further pointed out that "accredited peer-operators would not have suffered the current predicament were it not for the predatory actions of respondent Uber." With the big traffic problem that is Metro Manila plus inconvenient commuting options, ride-sharing applications have solved the problems of many commuters. Sna lang maranasa ng mga contributory ng Uber suspension and public transport. I really hate taxi. I need @Uber_PH back. Unlike most taxi drivers, you won't get rejected despite traveling a huge distance. Unlike most taxi cabs, you get exact change and a receipt, plus you can even file a dispute if there's any discrepancy in your bill. Since it’s a ride-sharing service, you get to spend less since more people are paying for one ride. (Don’t even get us started on promo codes that can sometimes just decrease our pay to zero!) There’s even that issue on safety especially if you need to go home past midnight. sana maisip ng ltfrb kung paano bubuhayin ng mga uber drvier yung pamilya nila dahil sa suspension na pinatupad nila. But more than the inconvenience of hundreds of commuters, this suspension also gravely affects the Uber drivers themselves. That’s one month of no food on the table, having to get loans just to pay the bill, and other financial problems. I'm all for penalizing @Uber_PH if they violated a rule, but why doesn't @LTFRB suspend taxi operators whose drivers commit worse offenses? The law is the law, they say. But there must be other ways to penalize Uber, right? Well, LTFRB thinks otherwise. Without this ride-sharing service, more private cars are probably back on the road now and the never-ending traffic problem continues. I feel bad for the underpaid #LTFRB staff who'll handle angry Uber customers for a month dahil out of touch ang mga boss nila. To say that people are furious is an understatement. But we’re just a minority, right? At least according to LTFRB...in 2015. Now that you're gone, it's hard to get Uber you. Wala na ngang forever, wala pang #Uber . Saklap bes. ???????????? Since the announcement, the riding public has been hoping that it gets straightened out soon. Of course, expect the Internet to come out with hugot puns. So @Uber_PH just went back online after filing their Motion for Reconsideration; but then, @LTFRB Chairman says "the order stands". Uber worked fast and filed a motion for reconsideration. After five hours of suspension (and the morning rush hour), the application looks like it's back for now—much to the relief of commuters. Let's just hope it stays that way.